The history of changes to items is saved on Yandex Map Editor. Click History of map item. The “History of map item” window opens, which contains the list of events that have taken place with that item since it was last accepted by the moderator. Each entry shows the name of the item, its type, contents, author, and event data. If the event consisted of adding or editing attribute values, then the card will display information about the current and former (crossed-out) attribute values. If the event consisted of changing the item's shape, then the card will display information about the former (red) and current (green) shape. The Undo edit button accompanies entries in the list of events that have taken place with that item since it was last accepted by the moderator. For how to undo an item edit, see Section 2.10.6.1. Undo edit. To go to an item, click Show map item (or Backspace). If it is switched on, then the edits that were made to connected items (i.e. not to the item itself) will be hidden, even though the changes also apply to the item in question. 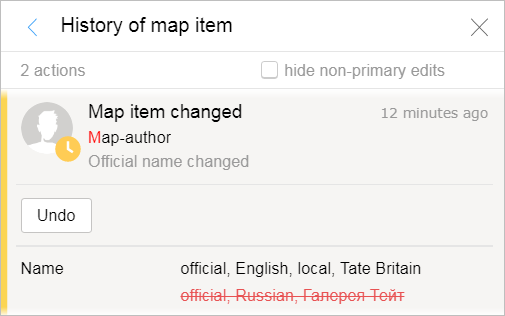 To exit the “History of map item” window and the attribute panel, click Close .